My thoughts often process in the form of song lyrics. Jim Croce sang the above title in the chorus of, ‘You Don’t Mess Around with Jim‘. My full time job and my moonlight business both have important deadlines this week with crucial steps converging the last two days. I love spinning beautiful plates. Helping others is my love language so when I am asked to speak this language, I have a hard time keeping quiet. All is well today but I had to burn some midnight oil to meet a deadline. Softball season started for my DH last night and something happened to upset my apple cart. It is unfortunate and my weary soul didn’t just let things roll off my calloused backside. I have to get back on my horse and keep on going. I’m going to have to forgive and communicate today. In her mind she probably sees her unfinished ‘to do’ list upon hearing that. The walks she didn’t take. The books she longs to read. The friend she misses. The deadline she missed. So. Many. Options. You just do what you can and you prioritized and juggle all the while. Sleeping and crying as necessary but sometimes it is hard to muster either. I wanted to cry so badly last night to let it go but couldn’t. Eventually I caught some z’s and today I will need to be cognizant of my patience and do all things with love. If I cannot do things with love, what is the point. I’ve known this for years but the evidence of how I’ve failed in this is insurmountable. Wait a minute… that’s a poor word choice. I can overcome that shortcoming! Today is a new day! Today I will tackle it with all I can muster. May the Lord be my strength and my song. Tonight I will find joy and rest. My heart is grateful God designed us to rest 33% of our day. That is how important it is for us to shut down our operating system. Rest in His loving arms. 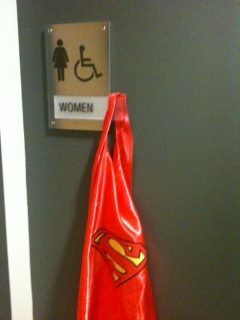 Every woman needs to know when it is time to hang up her cape. Note: The cape in this photo is real. However, the ability to leap tall buildings has faded over time.